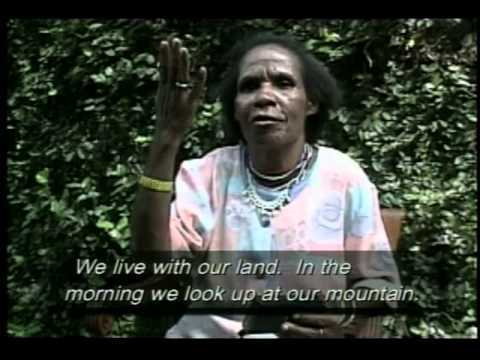 Mama Yosepha Alomang organized resistance to the world’s largest gold mining operation. Despite inhumane confinement and torture, she continued to promote traditional cultures, collective action and the well-being of indigenous peoples. The Indonesian province of Irian Jaya, known locally as West Papua, is among the most biologically diverse places on the planet. It is home to severely at-risk virgin tropical rainforests and the world’s largest gold and copper mine owned by Freeport McMoRan Copper & Gold, Inc., of Louisiana. For 30,000 years, West Papua’s indigenous peoples, including the Amungme, lived a sustainable existence, but three decades of mining practices permitted by the Indonesian government have destroyed rainforests, polluted rivers, and displaced communities. Freeport dumps at least 200,000 tons of tailings into local rivers every day, spreading deadly pollutants over vast areas. Meanwhile, Indonesian soldiers repeatedly, often brutally, suppress peaceful protests against the mine. In 1994, soldiers held the Amungme community leader Yosepha Alomang for a week in a room knee-deep with water and human waste, without food or drink. For six weeks she was tortured and interrogated for allegedly giving food to Papuan fighters resisting Indonesian sovereignty and Freeport’s land seizures. 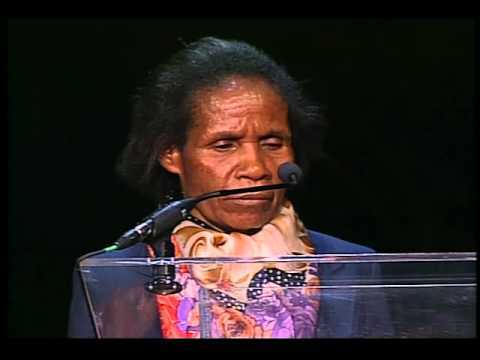 Because Mama Yosepha, as she is known, and other leaders continued to speak out fearlessly, these and many other abuses became more widely known. Following an incident (a rock pile at the mine collapsed into a lake sacred to the Amungme, killing four and flooding their villages with contaminated water) and in response to continued community activism, Indonesia’s government began examining Freeport’s practices. For over 20 years, Mama Yosepha has organized her community to resist Freeport’s destruction and the government’s complacency. Most recently, she created a women’s group, HAMAK, dedicated to human rights, environmentalism, and traditional culture.